Visibead plus | Alpine Products, Inc.
VISIBEAD PLUS highway safety marking spheres provide the highest level of safety for all nighttime driving conditions. In wet, dry or foggy weather, VISIBEAD PLUS spheres reflect more light, more clearly, than any other glass bead product. Developed by Potters Industries, the world’s leading maufacturer of highway safety marking beads, VISIBEAD PLUS spheres are three to four times larger than conventional glass beads. Their size and unique clarity allow for maximum retroreflectivity. In fact, VISIBEAD PLUS spheres exceed all current standards, a bonus when meeting safety marking requirements. Tight gradations and high rounds ensure consistency in application. 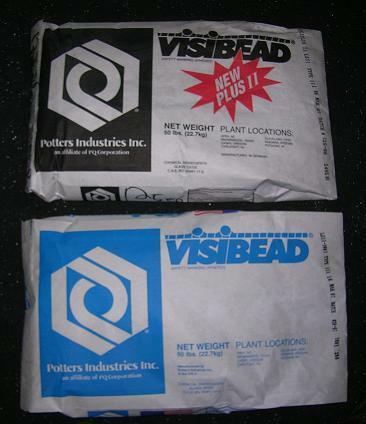 VISIBEAD PLUS spheres incorporate the latest in coatings technology and are chemically compatible with most binders. While installation is easy, Potters can provide on-site assistance to calibrate equipment for optimal bead distribution. -Under rainfall rates as high as half an inch per hour, VISIBEAD PLUS spheres are 200% more visible than conventional markings. -On wet pavement, VISIBEAD PLUS spheres recover 85% of their reflectivity seconds after the rain stops; conventional markings require at least several hours. -In fog, when condensed water droplets reduce the reflectivity of conventional markings, VISIBEAD PLUS spheres remain highly effective. Size: 14-20 (1.4-0.85 mm); a ranger of sizes offsets the effects of traffic and binder degradation. Compatible Binders: waterborne or solvent-based paint, epoxy, polyester, thermoplastic, PMMA and polyurea.